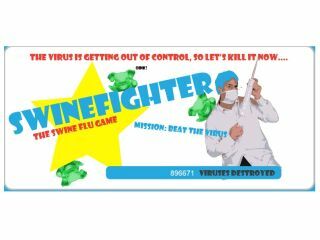 Swine Flu is officially a pandemic, which means – alongside hundreds of poorly-formed jokes and random tabloid panic stories – there will be a slew of casual swine flu inspired internet games over the coming weeks and months. The first one off the blocks is Swinefighter, which players charged with inoculating as may ill (green-coloured) pigs as possible within a time limit before they fly off around the world to cause yet further pandemic panic. TechRadar can only hope that more people get to play this fun little game than contract the actual disease! Swinefighter was created by the guys over at Heyzap, which also makes a widget that lets any website include free casual games. Just what you need. More diversions at work! Elsewhere, Kotaku notes in the "exploit 'em while you can genre, Games2win created a Somali pirate sniper game"
And while panic over swine fever – or 'Mexican heartburn' as Sir Terry referred to it on his radio show this morning – intensifies, reports from the ESA in LA reassure us that E3 will still go ahead in early June as planned. "The 2009 E3 Expo is progressing as planned. Public health officials are taking all appropriate steps and we continue to follow their direction on all measures. We look forward to a great event, and to seeing you in Los Angeles in June." Phew! Not even a pandemic can stop the onward march of the videogames business. If you want to track what's really going on with swine flu Google has released a new flu trends tracking system for Mexico based on the US Google Flu tool launched last year. "We have seen evidence in Mexico that Google users also search flu-related topics when they are experiencing flu-related symptoms," Jeremy Ginsberg, lead engineer for Flu Trends at Google, told Reuters. Ginsberg hopes the new tool will help to predict hot spots in an outbreak as they occur, giving "public health officials the chance to respond quickly."